A NEW METHOD OF ADMINISTERING THE MINERAL WATER OF THE ROYAL LEAMINGTON SPA. By JAMES THOMPSON, M.B. In April 1874, in an effort to promote the health-giving benefits of English mineral water and to defend English Spas against a popular perception that those of Germany were more beneficial, Dr James Thompson wrote to the British Medical Journal in London, recommending the drinking of Spa mineral waters. Dr Thompson analysed both the mineral content of the waters and those who “took” them, whom he divided into categories, – those who were able to stay close to a spa and benefit from having the mineral waters directly from the springs, those who took the waters in bottles or jugs, and a third category who never visited a spa, but were compelled to buy a very inferior product, bottled water. In his paean of praise for spa water, Dr Thompson continued: “Something must also be allowed for the change of air and scene, and the pleasure resulting from a visit to a town where every surrounding object is a thing of beauty. There must be benefit in exchanging the smoky dusty air of a city for the clear, bright, and health-giving atmosphere of such a town as Leamington, which is a town of gardens, and its sanitary condition closely looked after by competent authorities”. According to Dr Thompson, the water of the Royal Pump Room Well, when freshly drawn, contained nearly four inches of gas in each pint and was consequently bright, clear, and sparkling. However, when it had been standing for some time, it became dull, insipid, and “rather unpalatable” and a larger volume was required to produce what he described as the normal effect. 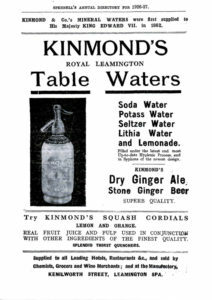 At the time Dr Thompson was writing, the Leamington Seltzer Water company, a mineral water factory of some size, had already been established in the town. The Seltzer Water Company used water from the weakest spring, and further diluted it with distilled water. After discussing the problems with Kinmonds, another Leamington manufacturer, Dr Thompson proposed to take the water from the strongest well, (at the Royal Pump Room), allow it to stand, covered, for 48 hours, filter it through flannel, then force through it carbonic acid gas under pressure. The Spa water was then to be bottled in French syphon bottles, maintaining the water’s medicinal qualities and keeping it fresh and sparkling for up to three days. Thus Royal Leamington Spa water’s “virtues [would be] preserved, and … the great medicine of Nature … supplied … in a pure and unadulterated state”. 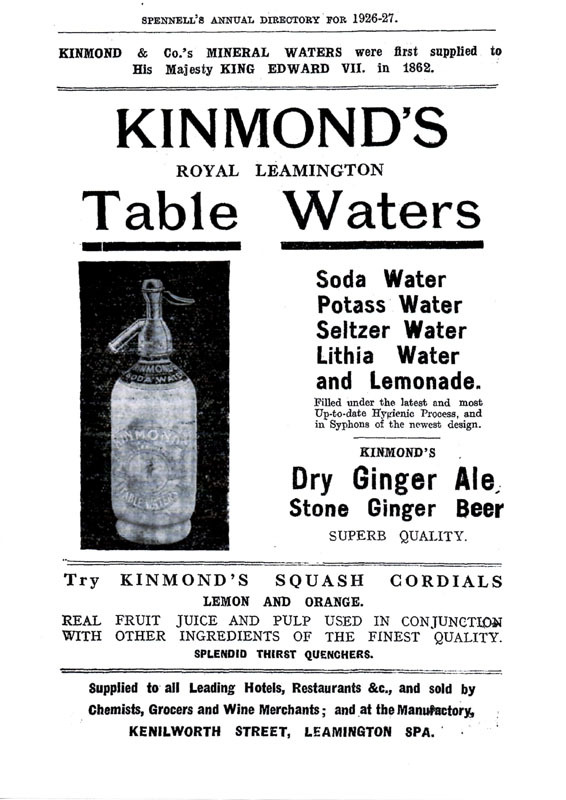 The advertisement shows that Kinmond’s of Kenilworth Street, Leamington, were still advertising and selling the product widely half a century later.